When we returned from church this morning, I needed to look up something online. Then I checked Craig's List just to see if anything good had been added since my 4 am feeding. Bingo! Free moving boxes in the university area. I sounded the FREE! alarm and we loaded up the wagon without even changing clothes. 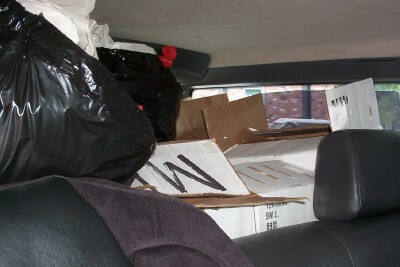 There was a huge pile of wardrobe boxes and sturdy dish pack boxes, along with Hefty bags of packing material. 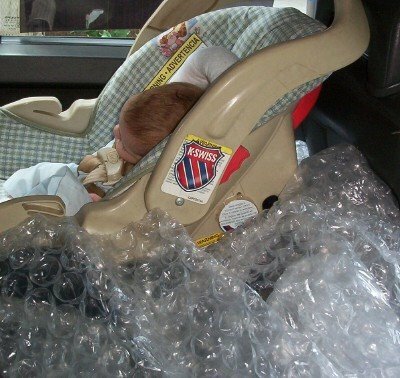 We strapped as much as we could to the top, creatively stacked the back, and even crammed some bubble wrap under and around the baby seat. 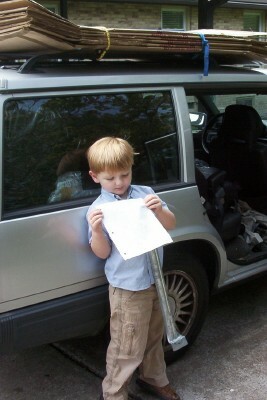 The whole time, Andrew is pointing with this pen and pad, explaining what components he'll need. "Yes, that will make a great launcher." Meanwhile, the baby is busy releasing four days' worth of constipation--with the diaper bag now lodged permanently under our loot. I was laughing from the hilarity of it all when I noticed a nice young family strolling down the sidewalk. They eyed us with suspicion. I guess we looked a little too gleeful to be picking through the trash! We were so grateful to have those expensive moving boxes, though. man, yeah. Those moving boxes ARE expensive.